Jefferson Cody’s wife was stolen by Comanches ten years ago, and now every time he hears of a white woman among the Comanches he goes out and buys her back. The movie opens with a typical Budd Boetticher shot of a lone horseman making his way through the Lone Pine rocks, and the horseman is Cody (Randolph Scott) on another such errand. This time the white woman is Nancy Lowe (Nancy Gates), and she’s grateful for the rescue but uncertain how she’ll be received when Cody returns her to her husband and family. Jefferson Cody (Randolph Scott) barters with the Comanches for Mrs. Lowe (Nancy Gates). Cody and the newly liberated Mrs. Lowe are resting up at Comanche Station, a stagecoach swing station locked up for now, when three other riders come up, engaged in a running battle with the Indians. They turn out to be Ben Lane (Claude Akins), cashiered from the cavalry by Cody years earlier when Cody was a major, along with two younger henchmen. 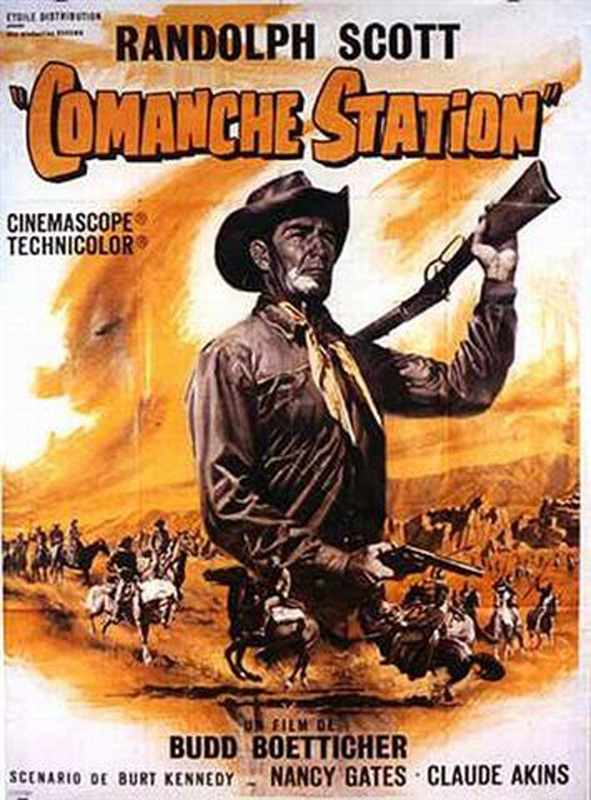 Cody helps them fend off the Comanches, and they form an uneasy alliance until they can all get through to Lordsburg and safety. One of Lane’s young guns is killed by the Comanches, and Lane saves Cody when Cody is attacked while reconnoitering—this despite the fact that everybody knows that Lane hates Cody and plans to kill him so he can collect for himself the $5000 reward offered by Mrs. Lowe’s husband. So the question isn’t what he’ll try, but how and when, as it was in Seven Men from Now, The Tall T and Ride Lonesome. We even have a pretty good idea of what the outcome will be (this is a Randolph Scott character we’re talking about, after all), but the interplay between the adversaries and the drawing of moral lines (or not) are what make it interesting. Jefferson Cody (Randolph Scott) and Ben Lane (Claude Akins), adversaries temporarily riding together. Meanwhile, Mrs. Lowe thinks that Cody is only bringing her back to Lordsburg for the reward, too. She clearly doesn’t understand either the degree of obsession that takes over Randolph Scott characters in these Boetticher westerns, or their unyielding moral rectitude. So that has to play out, too. Maybe her husband isn’t worthy of her and she’ll decide to ride off with Cody. After all, Lowe can’t be much of a man if he doesn’t go after her himself, can he? There are a couple of twists at the end, and this is one of the best of the Boetticher-Scott films. As with the best of them, this one was written by Burt Kennedy, and there’s some good dialogue that provides character development and differentiation in very few words. Scott doesn’t talk much, as usual, and when he does it’s in a convincing quasi-Southern accent. (Scott grew up in North Carolina.) Claude Akins as Ben Lane is playing a slightly more sympathetic bad guy than he is normally given, although the character of Lane doesn’t have the layers that, say, Lee Marvin or Richard Boone might have brought to the role. His two young guns as played by Skip Homier and Richard Rust are excellent. Nancy Gates, who retired from movies after this film, is attractive, feisty and convincing as Mrs. Lowe, although not as much is required of her. Much of the movie is spent either fighting Comanches or trying to get away from them, but there’s an undercurrent of sympathy for Indians that runs through this, as in other Boetticher films. It’s usually voiced tersely by Scott at some point in the film. 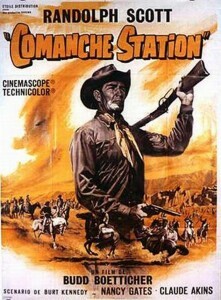 Cody (Randolph Scott) is surrounded by Comanches. This was the last of the Ranown westerns directed by Boetticher, and although there are remarkable similarities in plot, casting, location and production team for all of them, they never become too formulaic. Or if there is a formula, it’s so skillfully executed that they’re compelling nevertheless. They’re enjoyable individually as westerns, and taken together they constitute a remarkable body of work within a short period of time. For decades, this and the others were not available on video or DVD, but in late 2008 five of them were released in a set. Boetticher’s and Scott’s best work can now be much more widely appreciated, as it deserves. There could easily be two more of the Boetticher-Scott westerns on this list of greatest westerns –The Tall T and Ride Lonesome. Randolph Scott hung up his spurs and retired from movies after Comanche Station, to be lured out of retirement only for one last movie: the superb Ride the High Country with Joel McCrea. 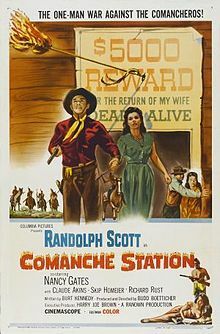 This entry was posted in 55 Greatest Westerns and tagged Budd Boetticher, Burt Kennedy, Native Americans (Indians), Randolph Scott on September 12, 2013 by Nicholas Chennault.